We have Sunday School and Bible class for all ages beginning at 9:15 a.m. each Sunday morning. Our worship service begins at 10:30 a.m. Everyone is welcome to join us! Also join us for Worship on Wednesday at 7:00 p.m. This is a great time to gather and be refreshed mid week in the fellowship of God’s people! The Lord’s Supper is a wonderful gift given to us by God. In the bread and wine, just as He says, Christ gives us His body and blood to forgive sins, renew faith, and cause Godly and brotherly love to grow. 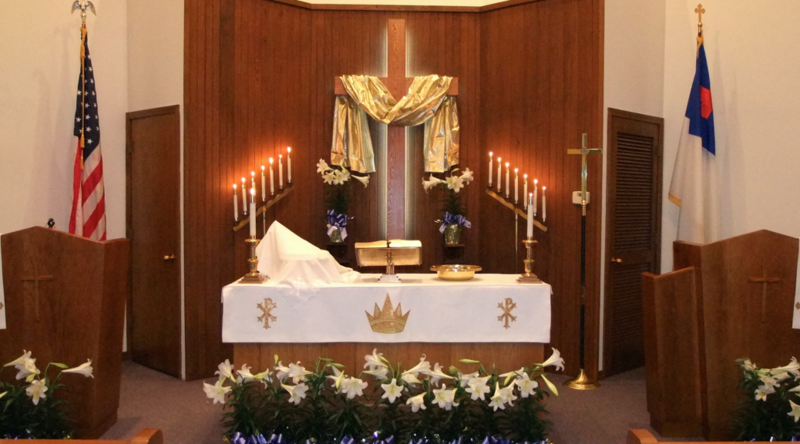 In this sacrament, we proclaim Christ’s death on the cross to atone for the sins of the world and His triumphant resurrection over the grave, to the glory and praise of God. To receive this means of God’s grace properly we should be able to positively answer the following: “Do I need forgiveness for sin?,” “Do I believe in Christ as my Savior?,” “Do I trust that Christ is truly present in the bread and wine?,” “Do I desire to live anew to God and others in love and service?” In our “yes” to these questions we join in a close and holy communion, a fellowship of faith. Out of Pastoral concern and care, and taking to heart God’s Word in 1 Corinthians 11:28-29: “A man ought to examine himself before he eats of the bread and drinks of the cup. For anyone who eats and drinks without recognizing the body of the Lord eats and drinks judgment on himself,” if you are unsure about what it means to take the Lord’s Supper or if you are not certain you can confess these teachings or beliefs, please feel free to remain seated or speak to the Pastor or an Elder prior to the service. 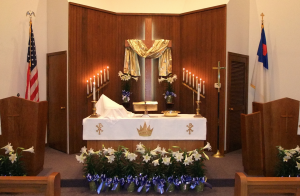 Other special services through the year include Ash Wednesday, Maundy Thursday, Good Friday, early Easter morning, Thanksgiving, Christmas Eve, and Christmas.